We can only assume that the falsifying of the minutes (see item, down-column) of the Watauga County Board of Elections was the final step in readying the submission of Matt Snyder's name for appointment as Watauga County elections director. State Board of Elections Director Kim Strach has the final say, and according to Jesse Campbell at the Watauga Democrat, word of that appointment had not yet reached Raleigh as of yesterday (or early this morning). Once Kim Strach has Snyder's name, she has 10 days to make a decision. Watauga BOE Republicans Bill Aceto and Luke Eggers were in an awful hurry to get this appointment done, so rather than do the right thing -- call a special meeting and actually take the formal vote to appoint Snyder -- they chose the corrupt thing: rewrite the minutes and simply establish a fiction as the truth. It's not the first time they've changed the minutes to suit their personal view of reality. Back at their very first meeting on the BOE, August 12, 2013, they "erased ... wide sections" of the minutes taken by the clerk and substituted their own sanitized version. That erasure made the Winston-Salem Journal. This is a board that has been a partisan tool since it was appointed, making every effort to disadvantage Democratic and young voters. Their actions have been ruled "unconstitutional" by the senior judge on the Wake Superior Court, and that case is still moving through the higher courts. Their appointment of a fully partisan elections director in Matt Snyder fits right into their pattern of corruption. First, Bill Aceto is supposed to be a professional, in the real estate business, one who pays attention to detail. 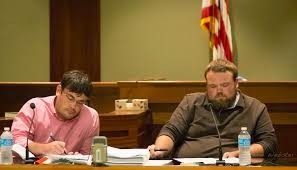 However, as seen from the Campaign Finance Reports submitted when he was Treasurer of the Watauga County GOP, he violated election law, either out of what I consider willful neglect or plain out and out laziness. If he read my resume, and knows me, as he claimed in a voice mail to me, how is it that he butchered my name. It is Deborah Greene; not Debra Greene. Second, as Secretary of the Board of Election, how is it that he has recorded that Luke Eggers called him out of order when no such thing occurred? One applicant for the directorship has already called him out for lying when he claimed she told him that she planned to retire in 2 years. Then he told another one when he claimed we played phone tag implying he attempted to discuss my qualifications. He also implied he was treasurer while Matt Snyder was Chairman, another misrepresentation of the facts. Mary Adams was the treasurer while Matt Synder was Chairman while Pam Blume was the Chair while Bill Aceto was the treasurer. And, now he claims that Luke Eggers called him out of order. I was there; that is far from the truth. Bill Aceto asked, "why would we hire someone who sent a letter to the State board of elections and tried to have us removed?" My response, because I had the professional ability to know when board members were no qualified, making me more than qualified to serve as director of elections (nonpartisan, as a Republican calling out another Republican). And, yes, I am an activist, an engaged citizen. We should all be engaged; ours' is a Republic form of government. We deserve better on the board. We do not need puppets. We need professional, honorable, mature and nonpartisan adults serving on the board of elections; and, we need the same in a director. Board members that do not have these qualifications will only appoint "one of their own". Mrs Greene. You are not qualified to be elections director any more than you were qualified to be on the Board of Education. You are a joke. Conservative. Post under your name. Be a man! No thanks. I'm satisfied being a woman. Which are you this week? Ok, then be a woman! Use your name. Whoa. The daggers are drawn, but Ms. Conservative can only resort to name calling. Must be a rubber one. None of this is important. What a waste. Two parties more concerned with defeating one another than actually helping anyone in this town. Shameful. I'm sure that I don't agree with Deborah Greene on much, but she doesn't deserve to be insulted on here. I would absolutely trust her with our elections, though - she cannot be swayed by people on either side, and she does NOT put up with corruption or with idiots. bettywhite....It was ok to insult her on here before she started her hate crusade against republicans. I think I understand though...You only want Republicans insulted on this web site. I dont mind insulting democrats and republicans alike. All they do is whine and point fingers at each other. Spoiler alert: neither party is going away and its a waste of time to complain about things as trivial as whether or not someone followed parliamentary procedure on a forgone out come. The board of elections has always been politicized, its always 2-1 in favor of the governors party. The Democrats behaved no differently when they held the board. The truth is that all this energy and leadership from both parties is squandered on fighting this childish imaginary war with one another. This county is full of students and locals who are always being pitted against one another by the spiteful squabbles of two self absorbed parties. Get over yourselves, have meaningful productive conversation with your rival party and help your citizens. We need jobs, we need growth, we need business. We dont need people self righteously calling each other names online. You are the leaders of the community for heaven's sake. Grow up and act like it. How very self-righteous of you, Roman! "All they do is whine and point fingers at each other." Well, when one party controls everything, from the Watauga County Commission all the way to the governor's office, the Republicans are doing a great deal more than whining and pointing fingers. They're passing laws constantly that hurt a lot of people. They raised state income taxes on most of us by eliminating deductions that we had counted on. They've meddled in local affairs to an absurd degree. They've hurt education. I could go on at some length. But according to your blue-nosed self-righteousness, when Democrats fight back, we're just whining and pointing fingers. These are life and death matters, not spiteful squabbles. "The Democrats behaved no differently when they held the board," you say. Just show me, please, when and where Democrats attempted to hamper the voting of a whole group of conservatives. I do not accept your premise. I do not accept your holier-than-thou attitude. If you're like 80% of unaffiliated voters, you don't even participate in all elections. Yet you feel very entitled to come on here and lecture everyone else. And if you find political "squabbling" so terrible, one wonders why you're lurking around a joint like this anyway. "You only want Republicans insulted on this web site." Wow, that's certainly a leap! I never said anything of the sort. Occasionally on any blog you get commenters who think they're cute and they come in and insult everyone in sight with the most petty, personal attacks that you can imagine. That kind of stuff is ridiculous, and they're just doing it to get attention. Are you in that category? Just trying to make a difference, I suppose. Average people are tired of it. I dont know the way but this is most certainly not life or death. Your comment is the embodiment of the defensive attitude that is poisoning this town's government. We need to be proactive. Assumptions about my character, dismissive attitude, looking for a fight rather than a conversation... these are the things we should be working together to change. Wouldn't you rather make an ally than an enemy? Well, Roman, I consider the denial of health insurance to a half-million NC citizens -- because Republicans in Raleigh think the ACA has Obama cooties -- is actually a matter of life and death. You know, these political "squabbles" that you're so superior to actually do have life consequences for many, many people. You don't think there's a pretty significant impact on Boone when Nathan Miller and his cronies take away $2 million in tax revenue? Oh Suzannah! Yes, you are absolutely right about the sales tax fiasco Nathan Miller's idea and passéd with the help of his mindless sheep. He didn't bother to research the history of his the allocation came about. He was so consumed in retribution, he put not only the town citizens in a bad position, he put the county citizens in one. I remember Blust, Yates and Miller all three saying as they explained their vote, "I do not have a problem taking away the tax from the people of Boone; they voted for the town council." There is something very unsettling when eldcted officials use taxes to punish the people for the way they vote. I voted for these guys and it was humiliating to me to see them do this. I spoke in public comment and told them that night how shocked I was that they would say such a thing and said, "Nothing good can come from this." And, now a change at the state level will cause our sakes tax allocation in the county to go down due to this prior failed "Miller" plan.